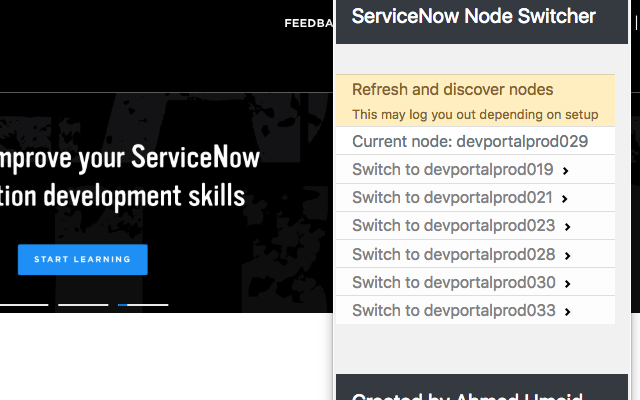 You can download the extension here: Node Switcher For ServiceNow – Now that’s out of the way, you’re obviously thinking why should you and what does it do? Well your ServiceNow instance(s) are generally hosted on a cluster of application nodes. ServiceNow handles the routing via their load balancer to a particular Node. Sometimes however, there are scenarios when you want to access a particular node (downloading node log files, monitoring node log files, killing transactions/sessions, checking node performance etc.). The only way previously to get onto the various nodes was to keep going in and out of incognito mode, accessing the instance and seeing which node you’ve been routed to. It is such a painful and time wasting procedure. This extension quietly monitors any service-now.com instance that you access, and records the node which you are on. With each recording, it also includes some meta data which enables the extension to force a re-route to that instance on-demand. All you have to do next time you want to go to that particular node, is click the extension and select from the available nodes, it will handle the rest for you. It is truly very simple, but I haven’t seen anyone do this before so thought a lot of people would benefit from it. I just tried this extension and works. It’s an awesome feature!!! Good job. Do you have any plans to share the source code? Or this is commercial product? Sure. I just want to modify logic a bit. this plugin is awesome. Unfortunatly our instance is hosted on premise with a custom URL so the plugin seems to won’t work for me. Is it possible so set the “base URLs”? Unless you’re using identical infrastructure, I doubt it’ll work anyway. The plugin works because of ServiceNows load balancers, not the application itself. Similarly we have custom URLs because we are using SN’s Edge Proxy however we are still on SN infrastructure. Is it possible to edit the base URLs? Nice Job Ahmed! Quick question is there anyway possible to direct the connection to app nodes that are failover app nodes? (i.e. If I know the BigipServerpool value information which is encoded IP and portnum information, would that work and could that be something your plugin would allow me to enter including the other glide session values needed? Basically an override to the discovery mechanism to add more nodes) Again love this extension it’s been a great gem when troubleshooting performance issues! This seems a very nice extension to have. Unfortunately I wasn’t able to install it in my Chromium browser. Package is invalid. Details: ‘Could not load icon ‘icon16.png’ for browser action.’. Is there any way I could make it work? Putting-in another vote for custom URL (edge encryption) support. Thanks for the great tool. It now accepts custom URLs. Can you update it and give it a go through the edge proxy and feedback if it works or not? Unfortunately, I haven’t got a client with edge that I can test it on! It works with some quirks. The Refresh and discover seems to be necessary at least one time for it to list the nodes. However immediately afterwards you have to clear cookies for it to work. But from there forward its working great. Hi Ahmed, Any progress with custom URL?